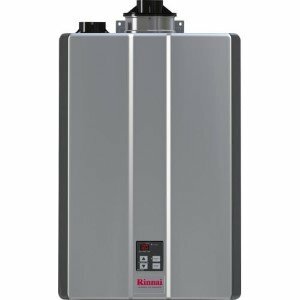 Rheem heat pump water heater is one of the latest products in the industry whose hybrid design provides affordable and ultra-efficient water heating, reliable and durable operation. 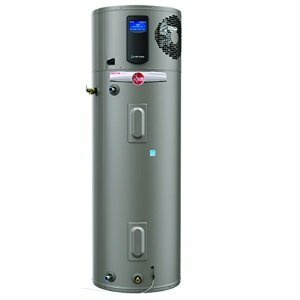 Rheem heat pump HB50RH is coming from the Prestige series and is the only type of all tank-type electric water heaters that are Energy Star recognized, which makes it eligible for federal tax credits and other incentives and rebates. Find out more about how heat pumps water heater work. Rheem heat pump is the ultra-efficient heater whose energy factor, EF, is 2.45, which is more than double of the most efficient electric water heaters. The reasons for the increased energy efficiency are several, from the process of how the heat is created and transferred to the water, powerful compressor of 8700 Btu/h, to its thicker foam of 2.5". High efficiency means less energy waste and high fuel savings, where the stronger compressor heats water faster. Rheem heat pump works as other heat pumps, like a refrigerator in reverse; it extracts the heat from the warm air, increasing the temperature with a compressor and delivering the energy to the water. It also uses two 2 kW Incoloy heating elements as the backup heaters, which are designed as the high-quality stainless steel resistor heating elements with the dry-fire protection. 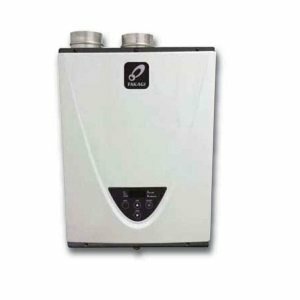 The HB50RH model is the 50-gallon unit that heats water 33% faster than the conventional 50-gallon models, and by providing the fast recovery (and first-hour rating is 57 gallons per hour), it is perfect for the average family of four and their everyday needs for hot water. Heat pumps are easy to install, similar to the conventional electric units with the standard water inlet and outlet, size and location. The best spots for Rheem heat pump installation are basements, garages, attics or utility rooms where the other heating sources (i.e., furnace) are installed. The environment with the higher air temperature is what helps the Rheem electric heat pump water heater to increase its efficiency; it extracts the heat from the warm surrounding air while it exhausts the cooler air. One of the main requirements for this kind of installation is that the fresh air has to be provided in the volume of 1000 cubic ft. The heat pump is equipped with an easy to use control panel with the LCD display and touchpad for hot water temperature control and with the five energy efficiency settings to choose from. The LCD control panel is conveniently located in the upper part of the unit, at the eye level. The touchscreen comes with the full-color and backlit appearance, and it allows the use and monitoring in the dark places. The service button shows you the current status of the unit, it displays some useful info about the model, also the temperature and diagnostics, allows easy testing and to set the alarm. The operation control button can either activate water heating (enabled) or put the water heater in a standby mode where it doesn't heat. The arrows allow you to set the temperature from the warm, through hot and very hot. The EcoNet feature makes the heat pump compatible with home automation, energy management, and demand response system. Rheem heat pump is designed with a few safety features; one is its freeze protection, to protect the unit when subjected to the freezing temperatures, and the other is the overheat protection from the high temperatures. HP mode - is the mode when the heat pump achieves the max. thermal efficiency of 2.45 and it is used when the demand for hot water is low. The mode will minimize power consumption. High Demand mode - is used for high demand applications, when two or more hot water fixtures are used at the same time. Both the heat pump and the electric elements are engaged as needed. Electric Heat mode - the water heater heats water by using the heating elements only, while the heat pump is disabled. The water heater in this mode will maximize the use of energy. Vacation mode allows you to set the water heater from 2 to 28 days or put on hold indefinitely. The tank temperature can be set to 82 F.
Energy Saver mode is factory set and is the best in efficiency for normal demands of hot water. The heat pump will use the compressor fully while the use of heating elements will be minimized. Rheem manufacturer provides a decent 12-year limited warranty on the tank and water heater parts. 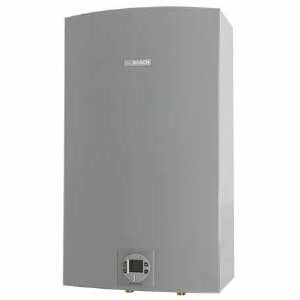 What helps Rheem HB50RH to have a long life is the resistored anode rod to protect the steel tank from corrosion and the exclusive Rheemglas tank lining found on most other tank-type heaters from this manufacturer. This feature and features described above are what makes this unit a good buy. Check out the price on Amazon. You might also find the HB50ES model, which is the same as the HB50RH model from above. HB50ES model is made for the Canadian market.